It is nothing new for Jason Voorhees and the franchise to be used in promoting a product. In fact, it's a flattering gesture. So when the NBC show Community began releasing posters exclusively over entertainment sites to promote their show, it was inevitable that we would see Jason at some point. IGN got the exclusive look at the parody poster of Friday The 13th, which is below. They defintely used the VHS cover art of Part 2 for this fun poster and this should help drum up support for the NBC show. With Sony -- who produce the series -- and the show's creative team and cast all working to help secure that renewal, there have been reveals for Community parody posters of famous movies all this week, with the cast tweeting individual character posters based on The Social Network, Community fan and friend Nathan Fillion revealing a Fifth Element-based poster, TV Guide spotlighting one influenced by Cast Away and The Wrap showing off a Magnificent Seven-style poster – with all the posters including the hashtag #sixseasonsandamovie, with the intent of giving NBC one more reminder of how much this show means to people. I’m very pleased to reveal the last of the poster parodies, this one based on the poster for the original Friday the 13th – or, if you're a stickler, the poster for Friday the 13th Part 2, which took the first movie’s poster design and altered it. Here, instead of the fearsome form of Jason, it’s the Greendale Human Being seen in silhouette, clutching several purple pens. 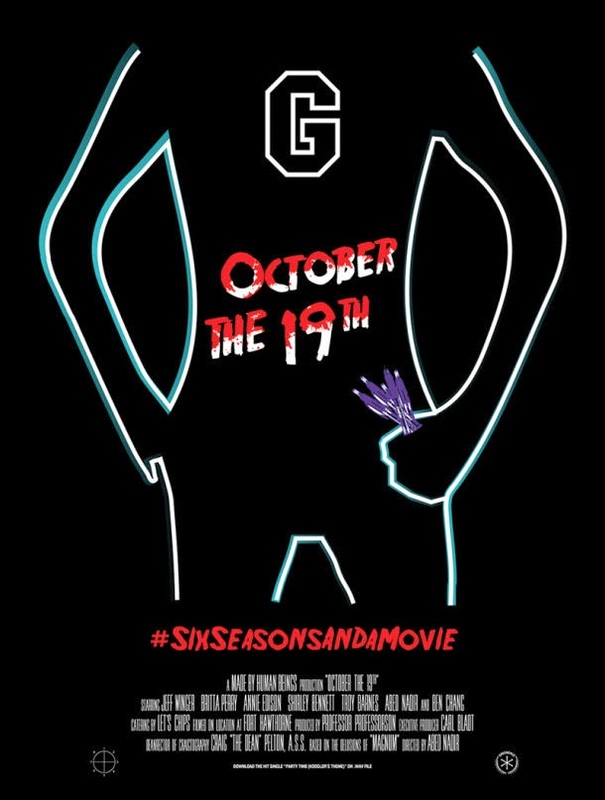 And, of course, the movie is called October the 19th – a reference near and dear to Community fans.